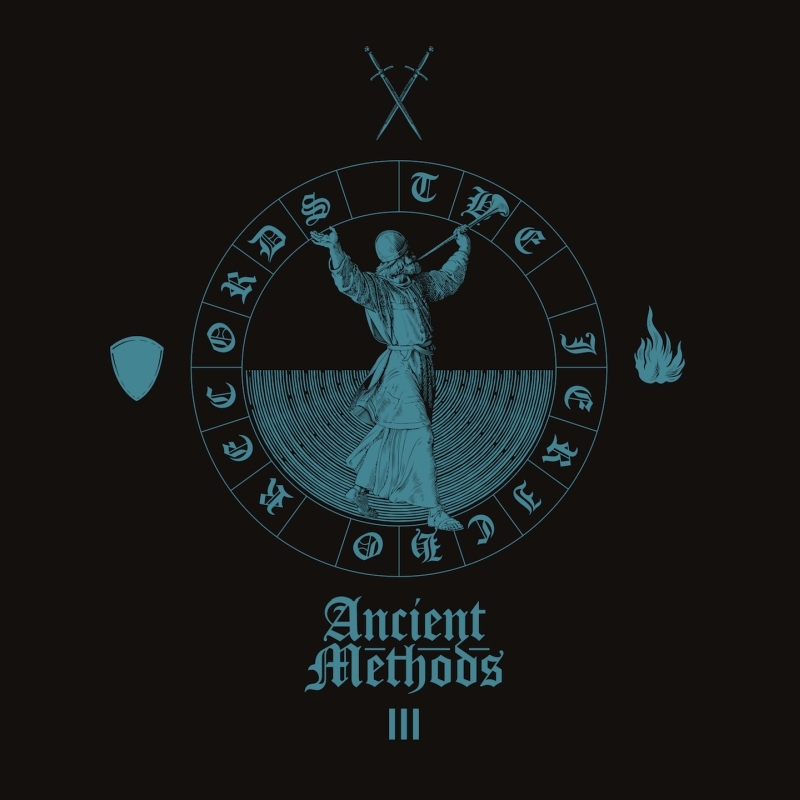 Five years ago Ancient Methods sealed the emissions of the eponymous label with the „Seventh Seal“. But one chapter remained to be written – the very first one. Labeled as a prequel to those seven releases „The Jericho Records“ materializes an idea, that has been in its creators head since the beginning of this project: to transform the biblical story and the accompanying picture, that can be found on almost all previous Ancient Methods releases, into sonic images. However „The Jericho Records“ is not aiming to be a soundtrack in a traditional sense, but rather an attempt to create the pictures by the music itself. Throughout the three chapters of the album (The City Of Jericho, The Battle and The Aftermath, each represented on one vinyl) these pictures appear sometimes as a rather abstract scoring of a mood, for example the tiptoeing sequences of „Treason Creeps In“ or the orchestral, melancholic prospects of the final track „In Silence“. In contrast you find very figurative pieces like the rhythmic battle in „Swordplay“ or the impenetrable wall of sub-bass throughout the album’s opener „Walls“. The album implements the „Music Will Tear Down Walls“ – approach, another conceptual layer that does not only radiate as one possible subtext from the ambiguous „Battle Of Jericho“ picture but has been also an integral and fertile part of Ancient Methods’ work to connect different music subcultures. It is just as conclusive to find all former collaborators with distinctive but yet coherent contributions being involved. Regis’ rough, „Gymnastics”-reminiscent synth lines fit seamlessly into the tribalistic assault of „Array The Troops“, whereas Orphx’ psychedelic noises in „The Seven Shofars“ manage to both pair up with the wall-shaking brass and deliver a stark contrast to the almost latenight-melancholic trumpet. Extraordinary vocal improviser Cindytalk delivers a moving, almost fragile sounding piece over dramatic strings („Moonset“) while industrial legend Prurient presents his impressive sonic and dynamic vocal range over epic 10 minutes („Walking On Cursed Soil“). For some the appearance of dark-folk majesty King Dude might be the surprise here, since only the keener listeners might have noticed the collaborative work. He ennobles the hypnotic percussions of „I Am Your New King“ with his unmistakable husky chants dignifying the track with true genre-bending qualities. Albeit the typical machine stomp is not entirely neglected („Twelve Stones To Divide Jordan’s Sand“, „The House Of Rahab“) Ancient Methods’ broad influences emerge all over the record and burst through the „pitch black techno war funk“ (qtd Boomkat). Medieval liturgical chants fuse with techno-metal („Omen’s Duty“), global folk music is meeting post-punk („The City Awakes“), industrial parts explode and collapse into a „Knights & Bishops“-styled techno rave („Collapse and Crack In The Storm Of Lights“), early 90’s techno is melting into a wall of noise with („neo“)-classical shimmers („Walking On Cursed Soil“). The comprehensive use of the trombone is not only another reference to the Jericho picture but a confession to the creators favorite instrument, lending the album not only an orchestral but also a personal guiding thread. Beyond the mere music one might discern contemporary statements here and there, e.g. when the composition of the opening track is juxtaposing a traditional western scale to a Phrygian scale divided by a central wall of bass, while the lyrics transform Kafka’s world-worn „Bridge“ into „Walls”. In any case inevitable to conclude: „The Jericho Records“ is a very personal artistic statement, mirroring the past of the project and leaving a foretaste of the things to come. And last – but certainly – not at least: It is an album you can dance to.